One of my own stamp sets was used to create this card, I made another card in monotone a while back using the same stamp set click here to see it. 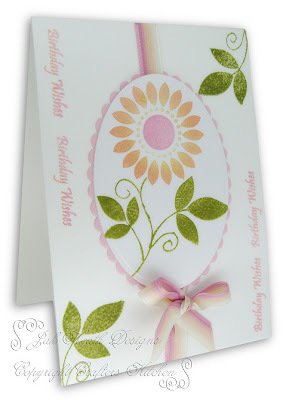 I used the Birthday Wishes down the side of the base card and staped the flower on the nestabilities oval shapes then using the leaves from the set stamped them at the corners os the card and used a pretty matching ribbon to finish the card. This is so fresh and pretty. Colours are wonderful and I really like the flowers and leaves. I love this one, Jak. Beautiful stamps. Well done you. Very fresh looking. Absolutely stunning Jak and looks so different from the monotone one you done a while ago. Adore the ribbon you have used too, a perfect match. I love it. Great card Jak lovely stamps too. Lovely cards Jak, where can I buy the stamps?